This Raspberry Acai Bowl is a refreshing & delicious breakfast, especially when you add your favorite toppings! This easy breakfast is ready in a few minutes. Let’s be honest – I’ve become a little bit obsessed with acai bowls. If you follow me on Instagram stories or Snapchat, you may have noticed that I make them all the time. Like, at least a couple times a week. They’ve also crept their way out of breakfast territory and into lunch and dinner territory, too. This Peanut Butter Acai Bowl is one of my favorites that I make over and over again because hello, I’m peanut butter obsessed. 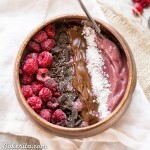 But I’ve made room for a lot of other favorites too – namely, this raspberry acai bowl! 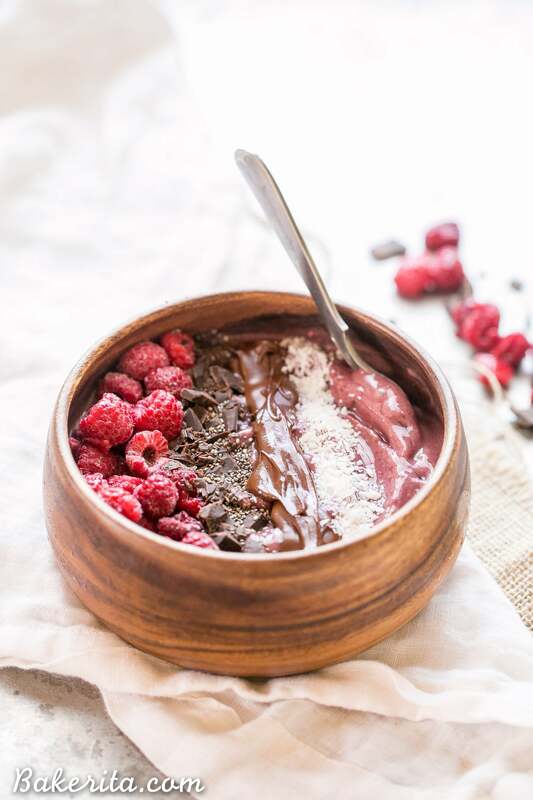 The bright freshness of the raspberries paired with the sweet acai berries makes such a fresh-tasting blend, and the frozen bananas keep things extra sweet and creamy. Besides some milk to help blend it smooth, that’s all you need. The acai I use comes from the brand Sambazon and comes pre-blended frozen in packets. You can get original or unsweeted – I always get the unsweetened version. I’ve been able to find it at most grocery stores around me, including Vons and Whole Foods. Before I toss it into the blender, I like to break up the frozen acai a bit so it blends smoothly and completely. For the toppings on this bowl, I went chocolatey. Along with a bunch of frozen raspberries, I added dark chocolate chunks, shredded coconut, and chocolate hazelnut spread. If you choose to go the chocolate hazelnut spread route too, give it a drizzle instead of doing what I did. It froze into a strip of chocolate hazelnut spread. Delicious, but not what I had in mind. 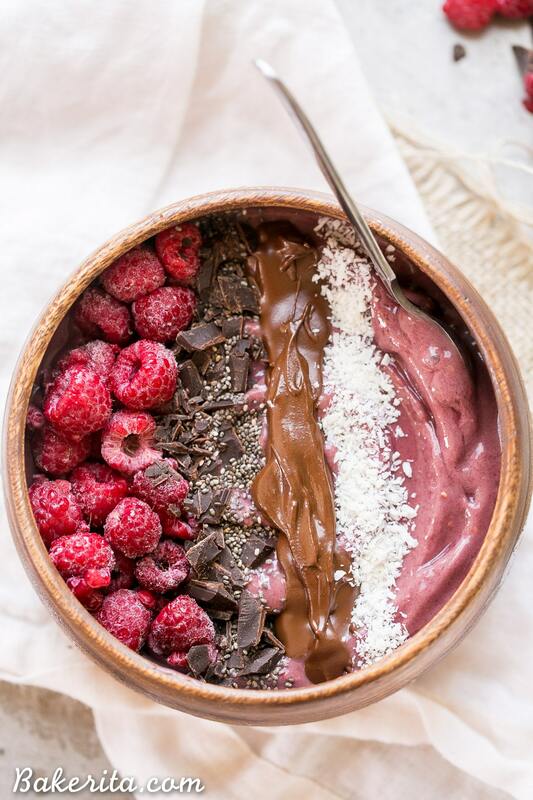 A drizzle of almond butter would also be fabulous on this acai bowl! Of course, the beauty of an acai bowl is it’s flexibility. Replace the raspberries with strawberries, blueberries, or really whatever frozen fruit you’d like, or a combo of a bunch of different fruits. In a high-powered blender, combine the bananas, acai berry packet, raspberry and 1/4 cup milk. Blend until completely smooth, adding up to 1/4 cup more milk if necessary to blend smooth. 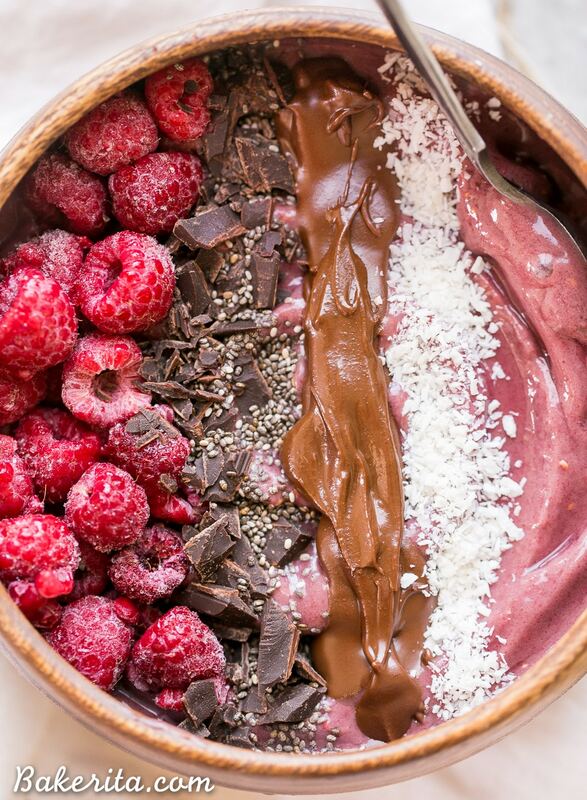 Pour into a bowl and top with raspberries, dark chocolate, coconut and a drizzle of chocolate hazelnut spread. Enjoy immediately! Seriously swooning at how beautiful this acai bowl is! I never made a true acai bowl before, and thats because I can never find the frozen berries! That needs to change because this is happening soon! Oooh you’ve got to track them down, girl! Acai bowls are the best :) thanks, Bethany! You make the best acai bowls, Rachel! I’m embarrassed to admit that I’ve never tried one before, but it’s on my list to do so! This raspberry version looks SO good! Love the touch of dark chocolate on top! Thanks Gayle! You need to get some acai and try one – they’re the best! Um, raspberries and chocolate for breakfast you say?!? I am in! How I wish THIS had been my breakfast this Monday morning! OMG…this is my dream breakfast! Raspberries and chocolate are like candy to me. Oh my! With the chocolate and the berries?? This sounds like a perfect breakfast! And I love the lighting in these photos – so pretty! mmm acai bowls are seriously the BOMB. I haven’t had one in ages though, and now i’m literally drooling over these photos. You have inspired me to go buy some acai juice next time i go out!! I have yet to try an acai bowl but this gorgeous one has me moving it to the top of my list!! SO gorgeous! All of your acai bowls are so yummy! I love the raspberry and chocolate combo and I would totally have this for breakfast, lunch and dinner!! I’m only like 40% sure what acai is, all I know is they sell the stuff covered in chocolate at Costco and it’s amazing. And also THIS looks amazing. I really need to investigate this because dang why isn’t this my breakfast. I have been drooling over your acai bowels lately on Instagram and I defiantly need to make one this week. 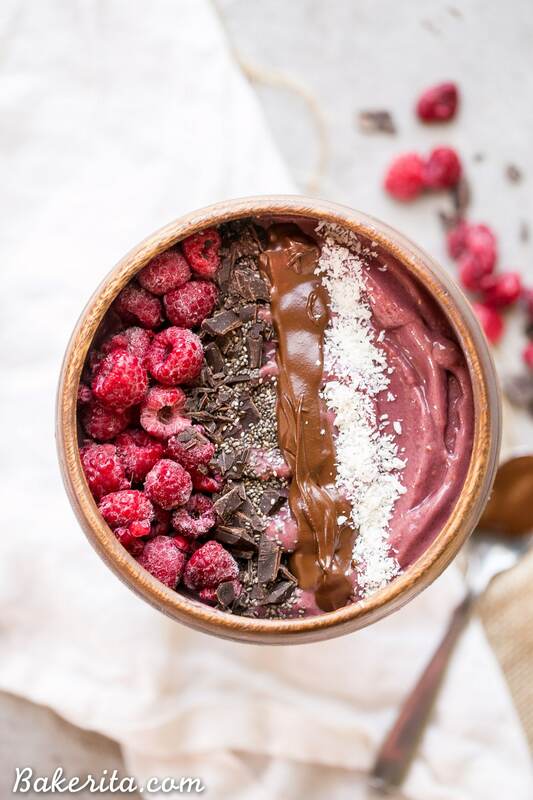 Saw this on insta this morning and was drooling- immediately headed over to the nutiva site and now I’m dreaming about that chocolate hazelnut butter! So good. This bowl – seriously – breakfast goodness right there! It looks so pretty, it’s begging me to make it! This is gorgeou and delicious. So fresh and healthy. Pinning for sure! Have a great weekend! Does anybody know about how many calories this is? It depends on the toppings you use, but if you want to calculate for your exact bowl, you can do so on myfitnesspal.com.